A 27 year global diet study by an international group of hundreds of researchers called the Global Burden of Disease 2017 Diet Collaborators made headlines all over the world in April 2019. The study found that one in five deaths globally in 2017 occurred because of poor diet. Eating and drinking better could prevent these deaths. Now more than ever the Stepbac® method can help change dietary habits and help take a “Stepbac® “ to your natural and healthy weight. Then you learn the Stepbac®action, to help you stop overeating. When you have learned the new Stepbac® action and after it becomes a habit then you will find it easy (yes easy) to control your weight. Stepbac® is not a weight loss diet or a food plan - it's a method that explains how we are all being tricked by the sugar (and salt and fat) in the food eat, into overeating, which leads to overweight and bad health. 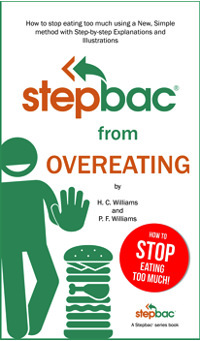 Read “Stepbac® from Overeating“ and Stepbac® to feeling better for the rest of your life. Bad diets killing more people globally than tobacco, study finds. “Stepbac® from Overeating“ explains four main things that make you want to eat too much and teaches you one thing, the Stepbac®action, to help you stop overeating.